We reach Uluru-Kata Tjuta National Park before sunset, after purchasing the entry ticket for 25 AUD per person (valid for 3 days). The road allows seeing half-seen the long-awaited red stone, rising majestically in the middle of nowhere. We soon shout out “we made it!” with such a satisfaction hard to explain! Uluru, also called Ayers Rock, is a huge sandstone rock of red colour whose shades change according to the sunlight. It has a circumference of about 9 km, a height of 864m and a 7 km deep! We park then at the Car Sunset Viewing to watch at the colour change at Uluru. The sun behind us gradually turns the sacred rock into an amazing red fire sandstone. It is surrounded only by unspoilt nature and a strange feeling of fulfilling calm. After this terrific view, we go to sleep in a free camping area just outside the National Park. It’s just a land where you can park with many others campervans: no toilets, no water, no light. Just silence and a stunning starry sky. It is also very cold during the night here, so we arrange a hot soup for dinner in order to warm up a little bit (we don’t have any kind of heating in the car). Be sure to bring with you an extra cover for the night, as well as plastic bags to collect your waste and leave these places uncontaminated. The following morning, we decide to wake up early to admire Uluru even at the first dawn lights. It’s not easy to leave the blanket since we are literally freezing, but once again nature fully repays us with an amazing view. At 10 am then we decide to join a group of rangers for the Mala Walk. It’s an interesting guided walk during which they provide us with information about the aboriginal rituals, the geological nature of the stone and curiosities about indigenous customs. Moreover, the rangers highlight the importance for the indigenous people not to climb the stone as a holy place. We really appreciate that the aborigines do not want to ban the tourists. They instead strongly believe in the educational power of the word rather than in the imposition of a rule. In short, these people welcome you to their home and then kindly ask you to respect their place, thus praying for your safety. The next day we visit the rock formation of Kata Tjuta whose name means “many heads”. We decide to do a few walks to better explore it: first "Valley of the wind" of 2.2 km and then “George walk” of 2.6 km, both fairly easy. Both its majesty and its bright red-colour fascinate us again and again. In the afternoon then, we can’t avoid stopping by the car parking to admire the sun disappearing behind this amazing dome-shaped rock. Two hours after the sunset, we decide to make ourselves a special present: the great exhibition of "FIELD OF LIGHT", created by the British artist Bruce Munro. 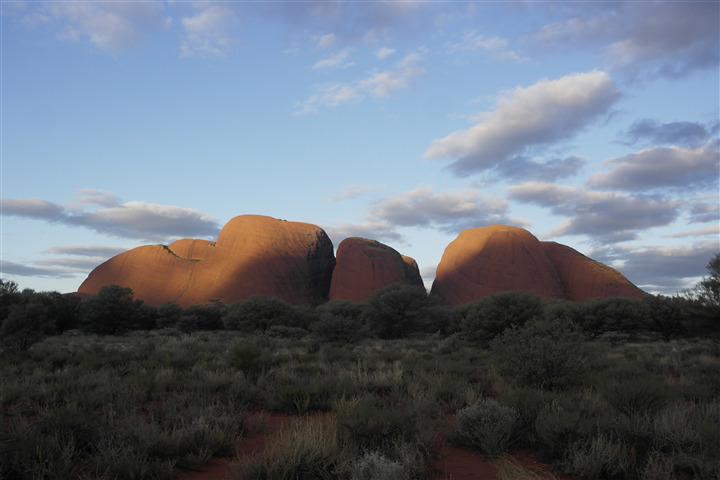 It is located just outside the Uluru-Kata Tjuta National Park, almost at the foot of Uluru. The exhibition is the largest iteration of a field of light to date comprising 50,000 stems, covering an area of over 49,000 square metres equivalent to nearly seven football fields. Munro says “The Field of Light at Uluru represents the convergence of the land and the culture and my own re-learning.” It is such a stunning place, beyond any words! 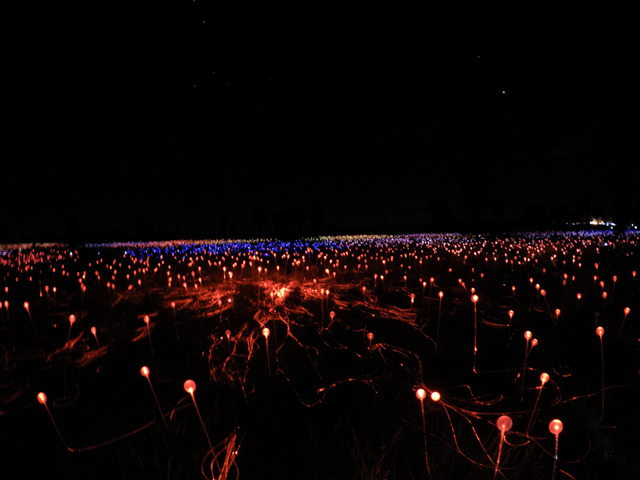 Just try to imagine the magic of a peaceful desert enlightened by an incredible starry sky from one side and by 50,000 coloured stems from the other side. Truly touching! Take advantage of this unique exhibition if you decide to visit this area by March 2018. The entrance ticket is of 39 AUD, including the transfer from the hotel. Let's go back now to the Watarrka National Park to visit the famous Kings Canyon. We arrive at 11 am and decide to walk along the King Rim Walk Loop of 6km (about 3 hours). Despite the first part of uphill steps, this trekking can be done at any age. Once again we are in front of landscapes with breath-taking views! It seems to be into another planet. Kings Canyon is simply amazing! It is really hard to express what we have experienced in these days. The Red Centre is much more than just a desert in the middle of Australia. It is literally the pulsating heart of Australia, mainly because of the special vibes you can perceive here. This adventure has deeply changed us. It has been a really strong personal challenge, both physical and mental. We believe it lastly defines what we were looking for, giving us the certainty that this is exactly the right place where we are supposed to be in.